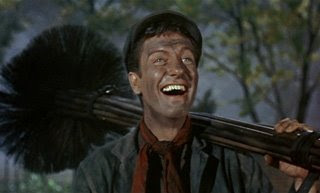 No, not chim chimeny chim chim cher-ee, I don't care how lucky a chimney sweep might be. No! Not chimichangas, the fried Mexican burrito, although those are awesome too! I'm talking about the Argentinian meat marinade/sauce. I've never had it. I've never made it. But have seen it on several blogs in the past few weeks and have been wanting to try it. I found this version through KimDeC's blog and the short story is that it ROCKS! Chop the parsley, garlic and oregano in a food processor. Mix vinegar, salt, pepper, and pepper flakes, then whisk in the olive oil. Whisk the two mixtures together. 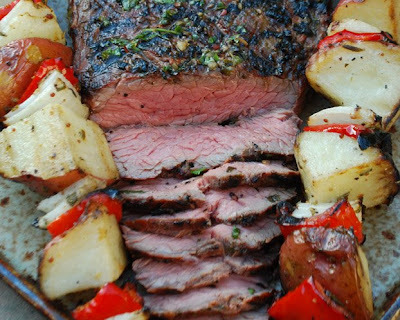 I scored a flank steak by drawing a knife lightly through in one direction at a 45 degree angle and then reversed it. I marinaded the steak for about 4 hours in a ziploc bag. In the mean time, I made up some veggie kabobs. I grilled the kabobs over indirect heat at about 400 on the Brinkmann grill while I seared the steak on the Big Green Egg for 3 min-flip-3 min - flip, 2 - min, remove to rest for 10 minutes. I thinly sliced (across the grain) that bad boy up and it disappeared! 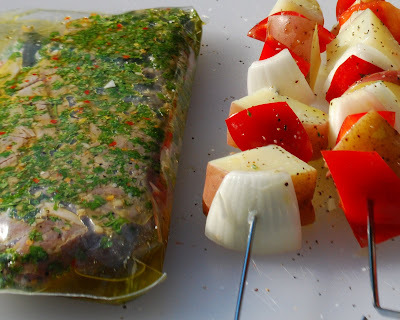 I love chimichurri and will DEFINITELY be making this again.